Every now and then a redirection example is requested in the mailing list. This recipe is meant to be a central archive of such examples. Remember there are some more generic examples both in the quickstart and in the redirection handler sections. There is also a wizard to automatically assist you with redirections. It can be found in the Wizards section of the Virtual Servers panel. If you are not familiar with how a domain name can be matched, please read about domain matching in Cherokee before proceeding. Redirections are essential on any modern web server, not only to display pretty URLs, but also to address usability and SEO issues. A common scenario is that of a virtual server being accessible both with and without the www prefix. It is customary to have both, but it is also a good idea to have only one of them as main entry point to a website, so that the number of web hits isn’t incorrectly halved when anlaysing web traffic. This can be done on a per-virtual-server basis, but it can be a cumbersome task if we’re dealing with a huge amount of virtual servers. Of course, Cherokee alows a much more practical approach, and setting up only one rule to handle all redirects is painless and straightforward. Matches can be performed against the host name, the actual request, or both, so the mechanism is quite flexible. If this is what you want, you can jump to the global redirection steps later on this document. Sometimes a site will have several domains or subdomains pointing to the same official name. For whatever reasons (site statistics, for instance), having many subdomains redirected to a unique subdomain might be desirable. This can be accomplished fairly easily. The general recipe consists in defining a virtual host with the sole purpose of redirecting petitions to the official subdomain. In our example, this could manage *.example.net and the .com and .org variations. The official name would then be managed by another virtual host (just for example.net). 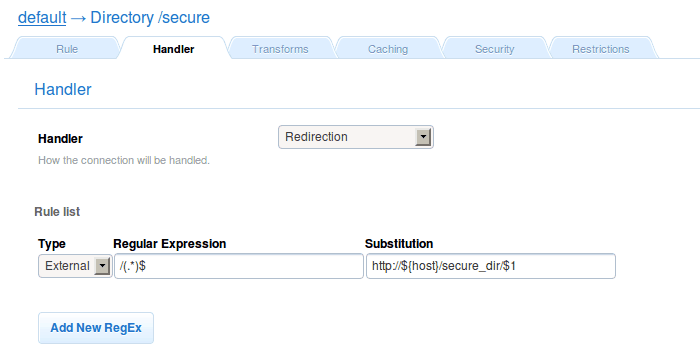 The redir virtual host will have a Default managed by the Redirection handler. Keep in mind the redirection has to be external in order for Cherokee to rewrite the the URL. If it wasn’t, the redirection would be applied but no change would be displayed to the users while browsing the site. Now lets imagine a scenario where the name of the virtual server matched is of importance for the substitution. For instance, supose you want all the traffic to the /secure_dir directory of a regular HTTP channel to be redirected to an HTTPS channel through a server whose name depends on that of the matching host. It is fairly simple to configure a www redirect for every (sub)domain name, where requests of the form http://www.domain.name must be redirected to http://domain.name. 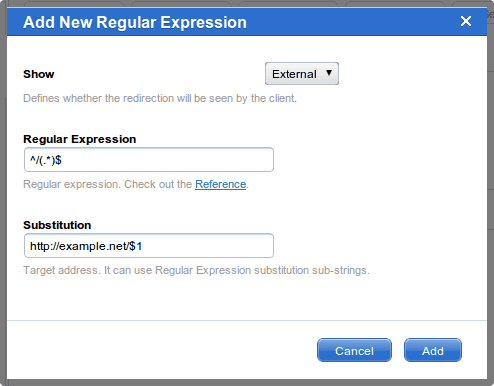 Create a new virtual server that uses "Regular Expressions" in the "Host Match"
In the same virtual server, set a "Redirection" handler as the Default rule.